We’d love your help. Let us know what’s wrong with this preview of Finlay's Folly by Nikki Broadwell. When Summer decides to head to Scotland in search of a long dead murderer, she has no idea what her trip will bring. Her ghost relative, Finlay Ross McCloud, who has sent on this fool's errand, has his facts confused. And when Summer discovers the truth she's already in over her head. 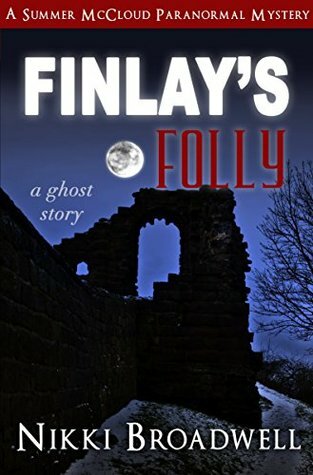 To ask other readers questions about Finlay's Folly, please sign up. This venture into the world of Summer McCloud sent me, in my armchair, to the home country of Scotland. Our heroine is sent there by the ghost of her ancestor, Finlay. As could be expected things don't go quite how the characters or the ghosts expect. Another amusing read for this series. There's plenty of mystery, comedy, and twists. After four books that are well written and attention grabbing, I can't wait to dig into book five and see where the characters end up next. I graduated with a BA in art and English from Sonoma State University in California. I've been an avid reader since I first learned how and a writer from my early teenage years on. I've had several art related businesses, including greeting cards and more recently a silk painting business. When I began to write in earnest I put aside the art, concentrating only on the writing. I've traveled a lot o I graduated with a BA in art and English from Sonoma State University in California. I've been an avid reader since I first learned how and a writer from my early teenage years on. I've had several art related businesses, including greeting cards and more recently a silk painting business. When I began to write in earnest I put aside the art, concentrating only on the writing.